Vintage 3 Strand Chain Faux Pearl Bead Silver Tone Necklace 30.5"
Faux Onyx and Faux Lapis Glass Beads. 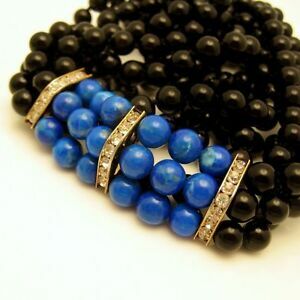 Faux Onyx and Faux Lapis beads. There are three knotted strands and three panel connectors with channel set rhinestones, which can be worn at the center or at the side.